PRODUCT DESCRIPTION: RCO Omega Gopher Bait offers the end user, whether homeowner or contractor the top of the line in gopher bait performance. This custom formulation blends the top grain accepted by gophers, the groated oat, with numerous flavoring agents and extenders to create a highly effective tool for below ground application and control of pocket gophers, who are active year round. RCO Omega Gopher Bait stands out from the rest because of results, especially apparent in crops like alfalfa, one of the toughest of all for the farmer. The bait is an acute, strychnine .5% that is incorporated onto the grain kernel with oils for uniform saturation and durability. Anti-oxidants and special extenders offer the end-user proven control. Flavoring agents assist in enhancing the attractiveness and palatability of the product. 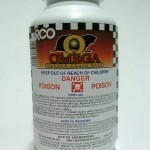 RCO Omega Gopher Bait is easily applied by hand or with a hand held dispenser unit. The grain flows uniformly and with small placements, results can be expected in most cases in less than 24 hours. Some plot work has revealed control within minutes and only meters away from the site of ingestion of the bait. Above ground risk to predators or other forms of wildlife or domestic animals is rare because of the below ground placement of this material. Always read the panel of directions for best results. 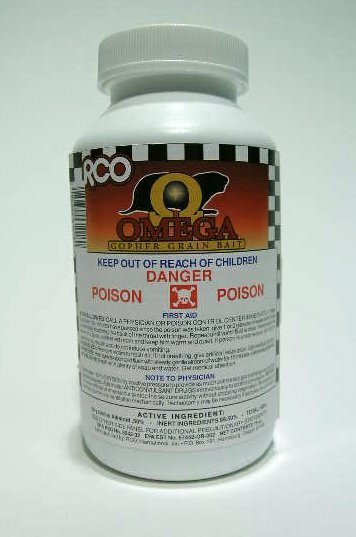 RCO Omega Gopher Bait is used throughout the year as weather permits. Most baiting takes place operationally during the Spring or Fall of the year when soil is most workable, Clean up work of nuisance populations missed during the Spring or Fall is accomplished throughout the year, as this pest does not go dormant as does the squirrel. Above ground excavations are indicators of infestations but tunnels are still being dug and soil can be moved into old non-productive tunnel systems. Watch for vegetative damage. WHERE TO USE IT: Down burrows, tunnels and mounds. RATE OF APPLICATION: 1 pound will usually cover 1/2 to one acre. Awesome! This is a great product. I haven't used the gopher bait yet this year, but I keep it on hand because it's the only product that I have found that actually works. I spent endless $$ on baits from Home Depot they were worthless.